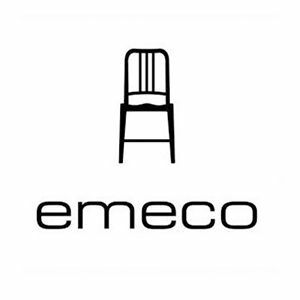 When today's chairman Gregg Buchbinder took over from his father in 1998, Emeco was producing 200,000 modest functional chairs per year out of its factory in Hanover, Pennsylvania. Gregg has since transformed the company into a producer of designer pieces, still based in the same area. Gregg realised that leading designers such as Giorgio Armani and Phillipe Starck amongst others were interested in the brand’s original 1006 Navy chair. This was and still is produced through a 77 step process that involves baking sheets of soft recycled aluminum in a hot salt bath to make them three times stronger than steel. Gregg pushed Emeco forward with new pieces that elaborated on the form and production of this chair which inspired many others including the first collaboration between Starck and Emeco in 2000; the Hudson chair. Other designers began to take notice including Frank Gehry, who ordered 125 Hudson rolling chairs for his studio. When Gregg delivered them, their meeting led to the production of the Superlight Chair in 2004, which expresses the elastic quality of aluminium as it’s frame flexes back and forth when you sit on it. Emeco has expanded the range of reclaimed materials it now works with to include coke bottles and industrial sweepings. In 2010, the brand partnered with Coca-Cola to recreate the 111 Navy Chair using melted down rPET plastic bottles. In 2012, Starck designed the Broom chair made from 75% polypropylene waste and 15% reclaimed wood fiber that would normally be swept into the trash. By finding strength in these reclaimed materials, Emeco gives new breadth to the initial purpose that started it all back in 1944.